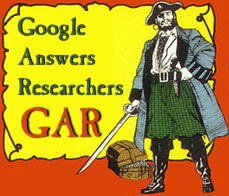 GAR means Google Answers Researcher, but it’s also a good sound for a pirate to make, so once a year, on September 19, we join millions of other people around the world to celebrate Talk Like a Pirate Day. You can join in too! If you’re new to this, check out How To Talk Like a Pirate (including chat-up lines, and sound samples in German, Chinese and Swedish). Google was asked to show a special logo today. Unfortunately, they couldn’t bring themselves to do so, but they did at least reply in Pirate talk. We wears a software patch. ‘Cuz that is who we are. We are the Google Pirates. GAR. GAR. GAR. Think of something! A computer guesses what you are thinking of, usually in 20 questions or less, at 20q.net. We call this kind of application “Artifical Intelligence“, and yet there's not much intelligence at work here. The computer is simply accumulating and classifying previous responses, then using a neural network to tie them all together. And yet, the results are impressive! Some of my answers above were a bit dubious. You might get different results with different answers – and you can also play in different languages, with a distinction made between American English and British English. You can also find this application as the “20Q” child's toy. 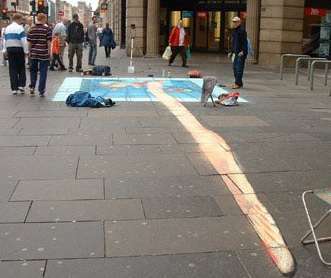 Julian Beever is an artist with an incredible eye for perspective – so good that he can mentally invert the perspective, leading to some amazing pavement art. 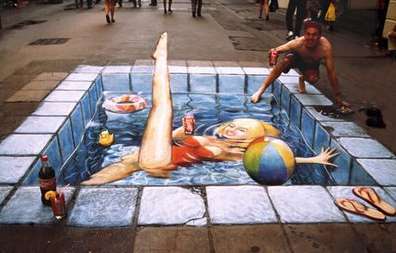 There are many more examples of Julian Beever’s amazing anamorphic illusions on his own website, and you can read more about the artist and his work in Wikipedia. Sometimes I wonder how people make discoveries. Sure you will have the famous “discovery by accident” quite often, but this one is really strange. What happens when you mix Diet Coke and Mentos? Well, it seems there´s a rather fast reaction that will make the Coke leave the bottle. Sounds boring? Check out the Diet Coke and Mentos page to see the possible results! 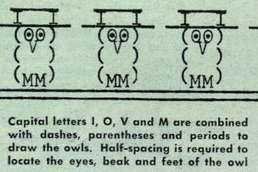 Every few months I cruise over to lileks.com for a healthy dose of the absurd. The site, with the tag line “Humiliating Defenseless Ephemera Since 1996” is a riot. Lileks skewers our strange American culture of decades past with a loving, witty and tender poke in the eye. Like his exaltation of home decorating disasters (though the best materials have been removed from the site and made into a book…nothing against books, but boo…hiss!) at Interior Desecrations, or the equally, riotously caustic category of Regrettable Foods (also, alas, now a book). My last visit, I explored some of the nooks and crannies of the site, and lo and behold, here is a tribute to one of America’s greatest but least-known — and certainly strangest — artists, Art Frahm. Frahm specialized in pin-up style works of women with celery whose underwear (the woman’s not the vegetable’s) refuses refuses to stay put. You may find the paintings amusing, odd, or perverse, but Lilek’s stream-of-subconsciousness commentary is hilarious, no matter what.